Activities to enjoy all weekend long! Photo courtesy of Iowa Artisans Gallery. All festivals feature FUN Stops for the kids to enjoy! 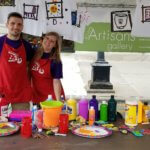 A designated FUN Zone can be found at each event where kids (and adults) can take a break and enjoy a fun activity. Keep an eye out for more information on the different organizations and businesses who will be hosting the FUN Stops this summer! If you have specific questions about our FUN Stops, please contact us by email or call our office at 319-337-7944.